Just the name of this meal conjures up extreme nostalgia for my college days. My roommates and I, eager to put our cooking skills to the test on our own, rotated dinner nights. There were some successes. And some not-so-successes. This quick, easy, filling and delicious meal made the taste cut and appeared very, very often at our humble college table. Frequent enough that it took me a few years to want to make it again after I had graduated from college. Eventually, I got the craving for it again and started playing around with the recipe. I’m happy to report that the five hungry boys in my family love this meal just as much as the four hungry girls did nearly 15 years ago. I’ve recreated it to incorporate a homemade cornbread layer (which I promise is hardly more work than using a boxed mix) and to make the beef layer a bit heartier with the addition of beans. The result is a classic, comforting rustic take on Shepherd’s Pie. 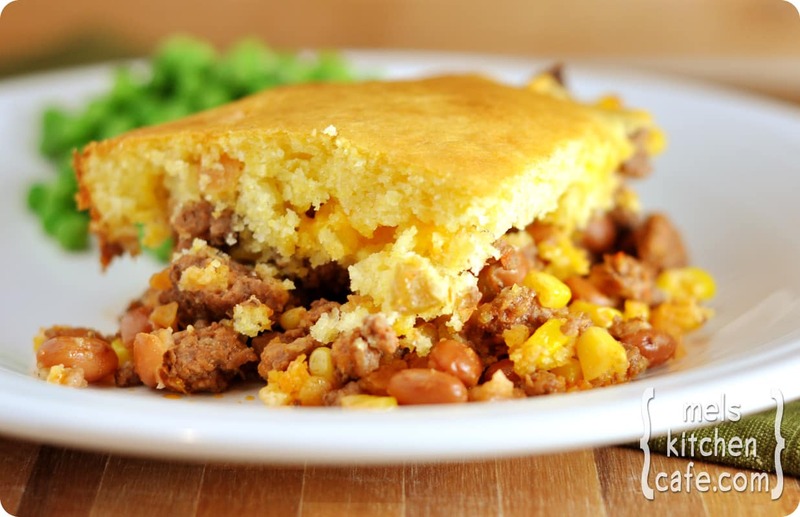 Nothing against the mashed potater casserole, but I’ll take this cheesy, beefy cornbread version any day of the week. Preheat the oven to 375. Lightly grease a 9X13-inch pan and set aside. In a large 12-inch skillet, brown the ground beef and onion, adding the salt and pepper, over medium-high heat until the beef is no longer pink. Drain the grease from the pan. Stir in the corn, salsa, and beans. Pour the beef mixture into the prepared 9X13-inch baking pan and set aside. We love this recipe! My kids wouldn’t eat it at first, even with the mildest salsa. So I tried it with plain tomato sauce (not the full amount, just enough to be wet) instead and now they like it! My husband and I use salsa on top and everyone is happy. Been a family staple for years. Sometimes add a little more filling or a little less topping. Just depends on how adventurous we feel. A neighbor made this for us after I had my second baby. It’s been a staple in our house since, the m9ment the air gets brisk. I’ve made it for friends going through breakups or having babies. Ultimate comfort food! Very dry. I made this exactly as recipe stated and it was too dry…not enough liquid in recipe. I used your ingredient list to find something different to make with the pound of GROUND BEEF I had on hand. Well, what a nice surprise this meal turned out to be (admittedly, I wasn’t quite sure what to expect)! Half the recipe was just right for my one pound of ground beef. Will be making again. I love this recipe! You are my very favorite online source for dinner recipes! I’ve tried several of your recipes over the years, and they are always great. As a newer cook, I’ve appreciated your consistent, simple and tasty dinner ideas very much. Thank you! Is this dish possible to make into a freezer meal? I believe others have commented about doing that in the comment thread. I haven’t tried it, sorry! I made this last night with a chili base. My English husband who loves his potatoes with everything (anything) rated this the equal of a really good shepherds’ pie. It will be on our menu often. Thank you. Have you ever made this as a freezer meal? How did it turn out? Would you freeze it before or after baking? How should the cooking be altered, if at all, after freezing? I haven’t made this into a freezer meal but I believe others have in the comment thread. Brown the ground meat of your choice; drain; add bean and Rotel Tomatoes. Stir and simmer for 10 minutes. Meantime, prepare the cornbread according to the pkg. directions and add cream corn to it. Layer 1/2 of the cornbread mix in a 9×11 baking pan or dish; top with all the meat mixture; top that with grated cheese; top the meat with remaining cornbread mixture and more grated cheese. Bake at 350 degrees for about 30-40 minutes or until brown. This was delicious! I made your Crispy Southwest Chicken Wraps earlier this week (found out I’m a TERRIBLE tortilla roller/cooker FYI). Since I only had small tortillas, I had a good amount of the rice and bean mixture leftover – into the hamburger mix it went! It was perfect. I’d probably make it the same way next time too! Is this gluten free or gluten free adabtable? It could be gluten-free if you adapted the cornbread topping, I believe. Mel!! I’ve missed you! I check in on the blog every now and then but for a long while I’ve just been making our favorite recipes from your blog because I know them, trust them, and know that they fit in our budget, but I’ve gotten the itch to try some of your new ones! I’m printing out several today and I am looking forward to adding some of these to my book! Thanks for all of the hard work you put into this blog! I came across this recipe earlier today and saved it on Pinterest. I found myself needing a cornbread recipe to go with chili so I tried this one (without the rest of the casserole, although I do plan on trying that). It was wonderful! I only baked it for about 25 minutes in a 9×13 dish. It went great with the chili! Mel I tried this recipe tonight and it is incredible! My boyfriend is fussy and won’t eat beans, so I used generic peas and corn for some veggies. I just want to say thank you so much for your willingness to share these amazing recipes which are no-fuss and never let me down, as well as using products that are easy to find and inexpensive – it gets disheartening reading delicious recipes that aren’t tailored towards a minimum wage budget, so thank you for the practicality of your cooking. All the best! Thanks, Hayley – your comment was so sweet and made my day. Super happy you loved this one! and the cornbread on top….delish! I used one pound of beef but kept everything else the same….thank you for a very tasty recipe yet again! Hi Mel! I made this last night but made a few switcheroos with the ingredients to make it meat-free (I’m cutting back 😉 ), and it was delicious. My filling recipe tasted more like chili, and my meat obsessed husband said it was one of the best things he’s ever eaten. I subbed soyrizo (really cheap and really good!) for the ground beef and added more vegis (celery, green onions and diced red yellow and orange peppers) along with the pinto beans, salsa, and yellow onions. Finally, after the whole shebang had been cooking for about 15 minutes, I basted the corn bread with “honey butter” that I made from butter spray and honey. Since it came out so good, I thought I’d share in case you want to try something new! Can this recipe be made in a crockpot? Perhaps add the cornbread topping in the last hour of cooking? Cindy – I have never tried it. I don’t know how well the cornbread would work in the slow cooker because of the high moisture but you could certainly experiment. Good luck! I just made this, and 45 minutes at 375 is WAY too long to bake! Mine came out dark brown- nothing like cornbread. 🙁 Looks like the next time I make it, I will be baking it at 350, for a lesser amount of time. I should also mention that I make the cornbread with coconut milk and an egg substitute (1T ground flax seed/ 3T hot water for 1 egg). Still tastes great. I wish I could write an essay about how I feel about your website but let’s just say I LOVE it. I’ve got 3 young boys and live in Las Vegas. A friend sent me your link because you’d added a post last spring about food allergies and she knew my 2 yr old has several food allergies. I have yet to make a recipe of yours that we haven’t loved. And I’ve made A LOT of them! One of my children is allergic to dairy, eggs, soy & apples (I know, that’s weird). I’ve found several recipes that are either free of all of those ingredients or can be easily altered and still taste great. One thing I love about your recipes is their basic ingredients that I usually have at home or can be easily found at the grocery store. They’re not off-the-wall ingredients that I’ve never heard of, have to pay a fortune for, or need to go to 5 stores to find. Cowboy Dinner is one of our favorites because one of my 5 yr olds is obsessed with cowboys, my 2 yr old with allergies can eat it (with a separate dish for him with his vegan cheese), and one of mine because everyone eats it. Thanks so much for your website!! I made this tonight! A hit with my 4 year old and everyone else! I only had 1# of ground beef. I thought about halving the rest of the recipe, but decided to follow it as if I had made it with 2#. It came out perfectly in spite of missing a pound of meat. I made this for dinner tonight and loved it. Thanks for a fab, filling dinner! Hi Mel! I was wondering if you had any input on making the cornbread topping gluten free…Have you tried substituting gluten free flour for the regular flour? Carrie – I’ve never experimented with gluten-free flour in this. Sorry! Saray – I’ve never tried cornbread below but sounds yummy! Just made this for dinner tonight and my husband just got thirds out of the fridge…. Two hours after our dinner! He can’t stop raving about it. Thanks again for another keeper! For those interested in freezing, I have been doubling or tripling this recipe and freezing the meat mixture in Ziploc bags. Then I just defrost the meat and add freshly made cornbread topping. Takes less room in the freezer this way and tastes great. I just wanted to mention that I cooked the meat mixture in a deep 12-inch skillet and then just put the cheese and cornbread on top of it right in the pan and put it in the oven. It worked out great! It cooked a bit quicker too (I’d guess 25-30 minutes) because the meat mixture was still pretty hot when I put the other stuff on top. Quicker and fewer dishes = yay! I made this tonight after searching Pinterest for a recipe that I could make for dinner that did NOT involve me going to the grocery store. It was absolutely delicious! I’ll be making this again and again. Any idea what the nutritional information is per serving? I’d love to know how many calories. 🙂 In the oven right now! Hi Amie – I don’t track nutritional info on my recipes but there are several online calculators you can google. Hope you liked the cowboy dinner! Wow! A winner! I really was surprised about how delicious this was. I used ground turkey and black beans. A keeper. Thanks, Mel! This was so delicious!! What would I do without this site?!?! I am a newlywed that is also new to cooking and I have found so many recipes my husband and I love from here! It turned out great and I will definitely make it again! Thank you! Hey Mel! I am making this tonight for my husband ,but he doesn’t like cornbread. Do you think I could use bisquick instead? If you have tried this and it was a disaster please let me know. If not I will post my results this evening after I have tried this modification to let you and future readers know. Cross your fingers!. P.S. Thanks for the great recipes! Dee – for that many people, I’d definitely recommend doubling it. You may have some leftover but I don’t think one batch is enough to feed that crowd. I love to serve this with a green salad and a couple varieties of whatever fresh fruit are in season. I made this last night and it was delicious. I added a can of creamed corn to the corn bread jiffy mix for the topping. Much more moist! I also added a can of diced tomatoes and some chopped green chile’s instead of sales because thatis what I had on hand. I will definitely make this again. Thanks!!! Made this substituting Jiffy corn bread mix and rotel. It was terrific. Making this for dinner tonight, for the second time. Just thought I would chime in and tell you we love it. We basically love everything from your website. Truth be told, I cook something from your website 5 nights a week, at least. Thanks for sharing all your wonderful recipes. I have to admit I wasn’t excited about this recipe as I was preparing it. I still have nightmares about my mother’s shepherd’s pie and this just seemed too much like shepherd’s pie for me to like it. As I stirred in the beans and salsa into the meat mixture it seemed too dry but I stuck to the recipe and it’s a good thing I did because it was perfect in the end. I’ll just be totally honest as admitt that I ate two huge portions! I haven’t had cornbread in years and this has made me wonder why. Amazing stuff! This recipe makes way more than we are able to go through in one sitting so I divided the cooked meat mixture into two 8X8 dishes and topped both with the shredded cheese and put 1 of the dishes in the freezer. I then preparred the cornbread topping and put half on the dish we would be eating for dinner and the other half on the now frozen meat mixture and but back into the freezer unbaked. Now I have a cowboy dinner in the freezer for an emergency. I did this prior to reading Katie’s comment above so I’m glad someone else has had some success with this method. I think next time however I will divide the meat/cheese mixture just the same but then just make 1/2 a recipe of the cornbread at at time. It’s takes less time to prepare than preheating the oven and would save baking time in the end. Just write the cornbread recipe on the foil cover of your frozen dish and you’re good to go when you need it. Also, I only used 1 lb. hamburger and it worked just fine. I have passed several people the link to your website because I am so in love with your food. Thanks for making dinner inspiring!!! Loved this! Easy to put together, doesn’t require fancy ingredients, and tastes great! It was a hit at our house tonight. I followed your recipe except I halved it. Was just perfect. My family was invited to a 5th Tuesday evening potluck at a local “cowboy church”. I was pondering what to cook when I came across your Cowboy Dinner – perfect! Due to sickness we missed the actual dinner w/ the cowboys, but we proceeded w/ our menu & had Cowboy Dinner at home followed by Cowboy Cookies. We knew we loved the cookies – my husband’s co-workers were thrilled when he walked in w/ a fresh batch of them yesterday! This Dinner is a new favorite for us – we really, really enjoyed it!! We planned to have leftovers tonight but my parents are sick so I’m taking them the leftovers along w/ your Creamy Chicken & Veggie Soup (& rolls, of course!). We’ll be trying your Clam Chowder tonight. Can’t wait!! Christina – a commenter a few above you, Katie, commented about her experience freezing this. Check out her comment – sounds like it will work! Do you think this recipe would freeze ok? We made this tonight for supper. Very easy and good! We always have Jiffy in the house so I cheated and used 2 boxes of that. My package of beef was barely more than a pound but wouldn’t you know I had some BACON in the fridge just dying to fill in for it! LOL. It was amazing. I will always make it with bacon from now on. YUM. I also barely noticed the cheese, so next time I’ll either leave it out completely, or mix it into the cornbread batter. I once made a cornbread topper with pepperjack cheese mixed into the batter. That was GOOD. Thanks for another winner Mel! I wanted so much for this to work out and taste delish. BUT, it wasn’t that great. My husband liked the cornbread top and even said it would be good to just scrape it off and have with butter and honey; but the mixture of the sweet on top with the spicy meaty mexican on the bottom just didn’t jive together. We all agreed that this was a dish not to be repeated. Sorry. Made this for the first time tonight. I was searching for a good meal I could use my canned ground beef with. Perfection! I’ve made several variations of this kind of meal before, none of which have really impressed my husband. However, when I made this last night for dinner my husband said he loved it and had multiple helpings. We LOVED it! Just checking back in after having this meal again tonight…from the freezer! I stuck this in the freezer UNBAKED about 2 months ago before having my baby, and pulled it out this morning. After having it in the fridge all day it was still mostly frozen, but I put it in a 350 degree oven and baked it for 45 minutes covered with foil. After 45 minutes, I took the foil off, turned the oven up to 400 degrees and baked for another 20 or so minutes. It turned out perfect. Hope that helps anyone else looking for some freezer meals! You are awesome for checking back with how it went freezing it! Thanks for helping others out! I used black beans and chopped chipolte peppers instead of the salsa and it turned out sooo incredibly GOOD! The smoky flavor of the chipolte peppers with the cornbread was such good combo! Delicious! Spiced it up a bit with some Cajun spices and some garlic, but I couldn’t stop eating it! Even our nine-month-old daughter enjoyed it! I am having our second baby in about six weeks and am starting to freeze some meals. I read the above comments about freezing, but I think I’m going to try freezing this BEFORE baking. I will let you know how it turns out. *Hopefully* good! :o) Love your site – many of our favorite dishes have come from you!! It sure does look delicious! If I halved the recipe how long should I cook it for? The same? Tessa – for a halved recipe, I would start checking for doneness after 25 minutes. So I made this last night. I made a few changes just because I am stubborn that way at times but it was loved. I ended up sharing with the neighbors behind us and they loved it so much. Thanks for sharing. I was looking for something different to try with ground beef and I think this is it!!! I’ll probably use black beans because that’s what I already have. I’ll be back to post how it turns out! Jessica (sorry for the delay in responding) – I use Pace Picante Medium salsa (sometimes chunky and sometimes not). Oh cool, this reminds me of tamale pie! I know I’d love it! This recipe looks so good, makes my mouth water. I love beans and cornbread. Thank you for sharing! I have to try this!! Laura – you know, as many times as I’ve made this, I’ve never frozen it so I’m not sure. I think you would definitely want to freeze after baking but I’m wondering if that would dry out the cornbread. Hmmmm, I think before I’d give advice to freeze, I would probably recommend halving the recipe if you don’t want a big dish. We call this tamale pie too! And I mix up this recipe, depending on what’s on hand, and if the designated eaters are spicy or not! This is a wonderful dish for cold wintery days, taking to a sick friend, pot lucks, etc! Thanks for sharing! This looks wonderful! A quick question for you – since it makes a lot, do you think it would freeze well? Thanks! Totally have this same recipe except my recipe calls for Taco Seasoning and Rotel tomatoes but I think fresh or jarred salsa like you listed would be much better! We had this for dinner and it was fantastic! The cornbread was crunchy on the top, soft in the middle and just soaked up a bit of the filling from below- perfect! It makes a LOT- good thing my husband liked it so much- he will be eating it for a few more days! Thanks again for another great recipe! Looks yummy! 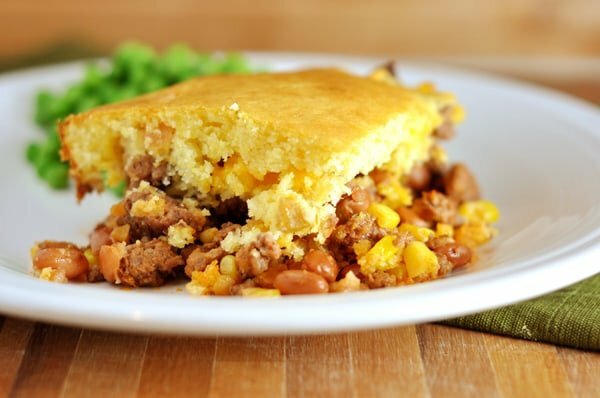 Do you have an issue with the bottom of the cornbread getting soggy from the meat mixture? This reminds me of my southwestern pot pie which I adore! Mine uses black beans and also has carrots with a creamy chili-powder laced sauce. I better get it on the menu for this week! I am going to put this one in my rotation to try. This looks great! So you’d use Pace Picante, like medium? What’s on your pantry shelf? Now THAT is some comfort food! Mmm… I used to make something like this with a boxed cornbread mix. Since I try to stay away from packaged food these days, I’m definitely going to try your homemade version soon! My husband will love this – thanks! I’m making this tonight! Thanks for the dinner idea! So glad I ended up here… I’m making this tonight. It looks awesome! This is so going on the menu later this week. I have no grocery money left and I’ve been trying to us stuff from in the house and I have all the ingredients on hand. Added bonus several of those items our on a shelf I need to clean out of the freezer. My mouth is drooling just thinking of it. I call it Tamale pie too! But I kinda cheat and use leftover chili as the base and Jiffy cornbread mix! Yum…what a great meal. The cornbread topping is a perfect finisher. 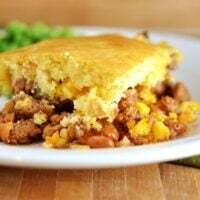 My husband’s familiy calls this tamale pie – a great easy dish to make when you’re in a cooking funk! I am a huge fan of dishes like this–I still can’t decide if I like it better with cornbread or mashed potatoes. Both are truly delicious though! I made this tonight and the family loved it! My 7yr old couldn’t get enough! I do recommend adding more salsa but still very yummy! I did do a short cut on the cornbread I used MarthaWhite’s mix which was perfect!